This page is intended to guide visitors that have never seen stereogramic effects and those viewers who may be a bit rusty. You may want to first read the About Stereograms page to get an idea of what you are about here. If you can see the 3D effect in the images below, you will also be able to view hidden-image type stereogram. If you ordinarily wear glasses to read off your monitor's screen, you will likely need them here. I have found that single lens glasses (as opposed to bi/tri focal, or progressive lenses) work best. Be sure to view straight on as possible. First: let's try a visual aid. After that are practices for viewing without aid. By placing a cardboard between your eyes (Fig, 2) you cannot use normal or cross-eyed vision. Instead, you are forced into parallel vision which is just what we need for Color Stereo stereograms. A cardboard about 8 x 11 inches. I have illustrated a cut-out for nose and glasses, but none is necessary. Unlike cross-eyed vision, there is no strain or discomfort with parallel vision. The essential key, in fact, is to relax your eyes into viewing this way. 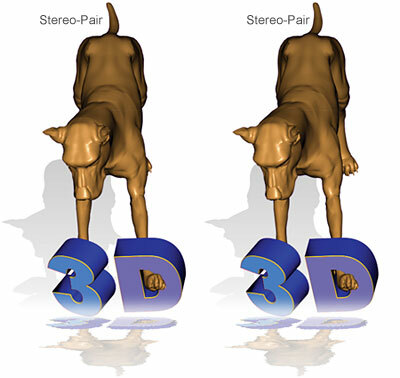 Below is a stereo-pair image. Place cardboard directly in middle of pair, as illustrated in Fig. 2. Now place other end of cardboard between your eyes. Disregard focusing, for now. If alignments are good, you should see only one image. Now relax your eyes, and slowly bring things into focus pulling your head back. Remember, you do not think you see a 3-D effect--you will know for sure. When you are sure, hold that focus and remove cardboard. You should now see three images: the one in the middle containing the 3-D effects. Congratulations, you are now viewing an autostereogram as it should be seen. Below are practices without aids. The only thing you'll need here is a monitor and two eyes. Let go the normal way you focus on something on a page. Let the eyes relax. Is that it? Two zeros? What you want to do here is have your mind process these two objects until they appear as three. Let the eyes relax, and move your head forward or away until three zeros appear clearly. Your primary inclination is to focus on the above two objects as is normal. But now, look behind them; look into the inside depths of your monitor and forget about focusing. Try this for awhile, until you gradually see the three zeros. You can also practice this with two dots, a couple inches apart, on a piece of paper. Try staring through the paper at a space a few feet behind it. So where does that center image come from? It's helpful to remember that visual perception happens in the brain--not the eyes. What we're doing here, is fooling the brain. The eyes are feeding it visual information as usual, but not in the usual manner. The mind gives us a middle object. And if you introduce some subtle offsets into two otherwise similar objects, the mind will perceive the famous 3D effect we're here for. If you view three objects as an autostereogram, you should perceive four objects. Four objects will look as if there are five, etc, etc. And now for some 3D. Between these two objects, another object should appear with the smaller square floating over the larger. Practice # 4 Still cant see it? Pull back, and focus normally on the center object of the three, below. Now lean slowly forward into the screen holding that focus until it is broken or you see four objects, clearly. I hope this page has helped. Master these practices, and you should have no problem moving on to full fledged autostereograms.